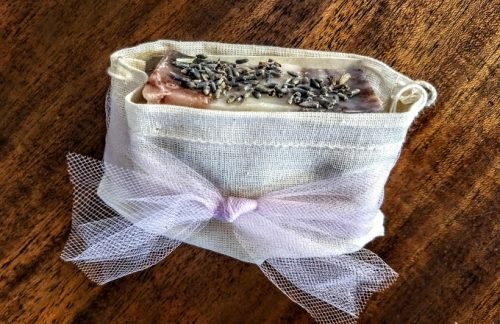 Short Product Description: This is a delightful soap with a delicate scent of lavender with swirls of color and topped with lavender buds. We are a mother and daughter team who love creating gentle moisturizing soap! We create our cold process soaps in small batches and hand cut each bar. Our base soap includes the finest quality oils, rich in vitamins A,D and E to soothe and moisturize your skin. Our scents are created with only essential oils and our colors are all plant based. Enjoy the long-lasting, creamy lather. Each bar comes in a cute 5 x 7 muslin bag that can be used after the soap is gone to store small items.